Food is a major part of our lives, but everything you're swigging, dipping, chomping down on, and sipping could be leading you straight into a funk. These days, Americans are eating a lot of Unhappy Meals. Everyday foods void of important nutrients, minerals, and healthy fats are also laden with jaw-dropping levels of sugar and dangerous fats that research has linked to depression. The stress of modern-day life makes it easier to cave in to the temptations of what psychiatrist Dr. Drew Ramsey, coauthor of The Happiness Diet, calls MAD--the Modern American Diet. Avoid the following 10 foods that can wreck your mood--brought to you by the creators of The Happiness Diet--and you'll be on the fast track to a happier body and mind! The Joy-Killing Truth: Agave is promoted as a healthy, natural sweetener, but that's simply a myth. "Agave isn't a health food," says Dr. Ramsey. "People have been misled." Billed as healthy because it does not raise blood sugar, the excess fructose in agave increases the risk of metabolic syndrome, setting the stage for brain shrinkage and mood instability. Healthy Switch: All types of sweeteners should be used in moderation, but turn to real maple syrup (make sure the label reads 100 percent maple syrup and lists no high-fructose corn syrup) and local honey for healthier sweetening options, advises Dr. Ramsey. These contain traces of important minerals and powerful plant antioxidants that promote health. The Joy-Killing Truth: Conventional hams come from factory farms where pigs are pumped full of antibiotics. These hams are also injected with sugar, salt, fillers, and nitrate preservatives that can trigger low moods, migraines, and even swollen ankles, and "cankles" can make anyone seriously depressed! Healthy Switch: Try a new holiday tradition: Wild-caught Alaskan salmon, bursting with memory-preserving, mood-boosting omega-3 fats DHA and EPA. A 2008 study found that fish oil containing the same omega-3s found in wild salmon is just as effective as Prozac in treating depression. Wild salmon is lower in contaminants like mercury, too. If fish isn't your thing, opt for pasture-raised pork loin--a top source of thiamine, a B vitamin needed for proper nervous system functioning. The Joy-Killing Truth: It's estimated that the average American drinks a whopping 600 sodas a year. These drinks turn to fat inside our bodies, sending our moods plummeting after the initial sugar rush, explains Dr. Ramsey. Healthy Switch: As a replacement, try adding a bit of organic fruit juice to soda water. Try these healthy drink choices that won't ruin your diet. The Joy-Killing Truth: For decades, scientists debated what was healthier for humans, margarine or butter. Now, the science is clear--margarines made of inflammation-promoting, industrial fats are harmful, and the high levels of omega-6 fatty acids could tamper with our mood and healthy insulin levels, too. Food corporations continue to change formulations, but the same thing is clear: Margarine is fake food, and the body doesn't know how to deal with it. Healthy Switch: Pastured butter--meaning butter from grass-fed cows--is higher in a special kind of fat called conjugated linoleic acid, or CLA. This fat features anti-cancer properties and has been shown to slash belly fat, lower heart attack risk. Pastured butter also packs a brain-healthy omega-3 punch that industrial fats used for margarine can't deliver. The Joy-Killing Truth: Raw pumpkin seeds or those you roast yourself are perfectly healthy. But those processed pellets in plastic packaging? Not so much. The food industry often coats seeds in a preservative called potassium bromate, which blocks iodine from being absorbed by the thyroid, says Graham. Without proper iodide levels, the thyroid--which is vital to maintaining good moods--can't function properly. In fact, the thyroid is one of the first thing psychiatrists check when evaluating a person with depression. Healthy Switch: Stick with those raw or home-roasted seeds, and don't just roast pumpkin seeds. Seeds from any winter squash can be roasted and are loaded with the same trace minerals and natural antidepressant properties as pumpkin seeds. 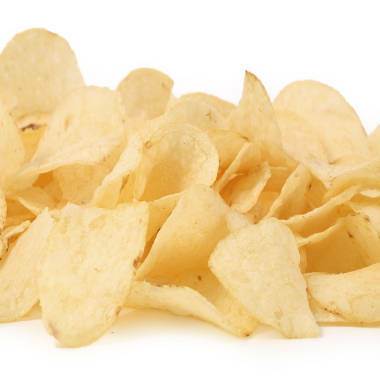 The Joy-Killing Truth: Between the winter holidays and football season, it's nearly impossible to dodge potato chips. But those taters are likely fried up in oils laden with omega-6 fatty acids that block out mood-enhancing, brain-building omega-3 fatty acids. Frying potatoes also creates the carcinogen acrylamide. Healthy Switch: Save money and your health by making these Easy Homemade Snacks, including your own microwavable popcorn. For a healthier, occasional potato fix, try baking smaller spuds with red or blue skin--the colored skin is packed with phytonutrients that benefit your mind and body. The Joy-Killing Truth: Many of us grew up being told bagels are healthy. The truth is, these breakfast favorites are packed with refined carbs that result in a major energy crash and mood bust before lunchtime. Plus, companies are doubling the size of bagels compared to just a few decades ago. Healthy Switch: Opt instead for organic, pastured eggs because they're full of important brain and mood-boosting nutrients like B vitamins, zinc, and iodide, and they'll keep you full and energized, recommends Dr. Ramsey. The Joy-Killing Truth: The packaged, salted peanuts commonly served at holiday parties are high in sodium and questionable food additives, including monosodium glutamate (MSG), an artificial flavoring linked to migraines, weakness, burning sensations, wheezing, and difficulty breathing in some people--and who wants to deal with that at a holiday party? Healthy Switch: Create a brain food nut mix by combining omega-3-rich walnuts, almonds rich in vitamin E, which protects vital brain fat, and a few selenium-rich Brazil nuts. (Selenium deficiencies are linked to depression and suicide.) For an added mood-boosting kick, toss the nut mix with rosemary and sea salt, and roast in the oven at 300 degrees for 15 minutes. Researchers are studying rosemary's potential role as a brain-protecting herb. The Joy-Killing Truth: Common in holiday baking, you should avoid vegetable shortening for the same reason you should be bypassing industrial-fat-derived margarine--an increase in omega-6 fatty acids that block out brain-building, mood-promoting omega-3 fatty acids. Healthy Switch: "The shocking baking swap is using pastured lard instead of vegetable shortening," says Dr. Ramsey. The reason? The main fat in lard--oleic acid--is a monounsaturated fat linked to decreased risk of depression. Look for pastured lard from a local farmer who raises grass-fed livestock. Lard gets a bad rap because of saturated fat content, but Dr. Ramsey notes that stearic acid, the main saturated fat in lard, isn't linked to an increase in heart disease, nor does it impact cholesterol levels. The Joy-Killing Truth: Many packaged sweet potatoes and even homemade recipes for candied or marshmallow casserole sweet potatoes call for multiple cups of sugar that will start the suffering process for your brain and mood minutes after eating. High blood sugar levels actually age our blood vessels, shrink our brains, damage vision and nerve function, and increase our risk of depression and Alzheimer's disease. Healthy Switch: Naked sweet potatoes--ones baked without all of the added sugar--are loaded with beta-carotene, a fat-soluble, brain-protecting antioxidant the body uses to manufacture vitamin A. This vitamin promotes the enzymes that create mood-regulating neurotransmitters like dopamine. The Happiness Diet authors note that an even better form of vitamin A comes from products like butter and eggs produced by animals raised on pasture, so don't be afraid to add a bit of butter with this kind of pedigree to your sweet potatoes. Can Eating More Vegetables Make You Happy?